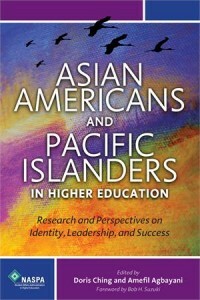 LONG BEACH — Doris Michiko Ching, vice president of student affairs emeritus at University of Hawaii, will discuss her new book, Asian Americans and Pacific Islanders in Higher Education: Research and Perspectives on Identity, Leadership and Success” on Wednesday, March 21, at 12 noon at CSU Long Beach’s Anatol Center. Ching co-edited the book with Amefil Agbayani, also of the University of Hawaii, with Bob H. Suzuki, former president of Cal Poly Pomona, writing the foreword. She will be joined at the event by several of the chapter authors. By the year 2050, the Asian American and Pacific Islander (AAPI) population in the U.S. is expected to more than double, according to the U.S. Census Bureau. Recent reports indicate that more AAPI students are experiencing difficulties attaining academic success in colleges and universities than in the past. “Asian Americans and Pacific Islanders in Higher Education” presents a compilation of statistical reports, research findings, and experiential accounts that counters the lack of information about this population. Although the community of AAPI students and professionals in higher education is relatively small, it is significant and diverse. The “model minority” stereotype, which positions AAPIs as well adjusted, well mannered, smart, hardworking, and from financially well-off families, has cloaked the very real struggles and challenges this population faces on college and university campuses. It has resulted in AAPIs being largely invisible or excluded from conversations, research, and policies related to diversity and equity in higher education. The authors, who represent a wide range of institutional experiences throughout the U.S., probe deeply and challenge current perceptions, even among those within the group. Through the authors’ research and narratives, the book gives voice and visibility to AAPI students and student affairs professionals. Some chapters are written in the context of racial history, power, and hierarchy in society and campuses consistent with Critical Race Theory and race formation scholarship. Policy-makers and responsible campuses must prepare themselves to address the underrepresentation and projected growth of AAPIs as a group and for specific AAPI subgroups in higher education, the editors say. This book will help faculty, administrators, and educational policy-makers who seek to advance learning outcomes for students of all ethnicities and strengthen the position of AAPI student affairs professionals, and thus invigorate the effectiveness and success of colleges and universities that aspire to achieve true diversity and inclusion. For campus map and directions, visit www.csulb.edu/. For more information on the publisher, NASPA-Student Affairs Administrators in Higher Education, visit http://bookstore.naspa.org.